HBO has put on two previous cards featuring fighters all in the super flyweight division, and they dubbed it “Super Fly”. 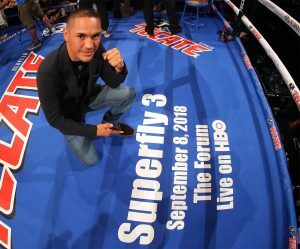 Saturday will feature their third Super Fly event, and it will be televised live on HBO from the Forum in Inglewood, California. Three fights will likely be televised. Kazuto Ioka will face McWilliams Arroyo in a bout that will have future title implication. The co-main event of the night will be between Donnie Nietes and Aston Palicte for the WBO Super Flyweight title. The main event of the night will be between Juan Francisco Estrada and Felipe Orucuta for the WBC Super flyweight eliminator. The undercard will feature fighters such as Alexanderu Marin, Bruno Escalante, Joselitl Velasquez, and a WBC Women’s Strawweight title fight between Louisa Hawton and Brenda Flores. The following is a preview of the two planned televised fights with implications for the WBC title. Donnie Nietes is one of the world’s best boxers that most American fans have never heard of. However, he’s currently thirty six years old and is nearing the end of his prime. He’s also fighting in a new higher weight class. He’s nine years older than his opponent, and will be giving up four inches in height and about two and a half inches in reach. Both boxers are from the Philippines, but Palicte appears to have had more success as an amateur. He represented the Philippines in the 2008 AIBA Youth World Championships. It also appears Palicte is the bigger puncher of the two. Only four of his wins went the distance, while eighteen of Nietes wins went the distance. However, as a professional, Nietes has had the better career and faced the better competition. He has beaten the likes of Juan Carlos Reveco, Komgrich Nantapech, Edgar Sosa, Francisco Rodriguez Jr., Raul Garcia, and Moises Fuentes. He was previously a WBO Light Flyweight World Titlist and a WBO World Minimumweight Champion. His lone lass was in 2004 to Angky Angkotta by split decision. Additionally, Nietes has fought out of the Philippines nine times during his career, so his record isn’t based on beating up lesser known Filipinos in a friendly arena. The one edge that Palicte might have over Nietes is his age and activity. Nietes fought once in 2018, once in 2017, and twice in 2017. Palicte has fought twice in 2017 and three times in 2016. Palicte has defeated the likes of Jose Alfredo Rodriguez, John Apolinario, Oscar Cantu, and Vergilio Silvano. His losses were to Junior Granados and Romnick Magos. Palicte size and age advantage should help close the gap in skill that exists between him and Nietes, but it likely won’t be enough to help him win the fight. When we last saw Estrada in the ring, he lost a close bout with Srisaket Sor Rungvisai. The fight was close enough for Estrada to remain in title contention. Estrada is still in the middle of his athletic prime at 28 years old, and will be facing an opponent that is four years older than him. However, Orucuta will have about a three inch height advantage and about a two and a half reach advantage. Both boxers are from Mexico, but Estrada has had the better amateur career. Estrada boasts an alleged record of 94-4 as an amateur. Estrada has been fairly active the past three years. He already fought once in 2018, fought twice in 2017, and only fought once in 2016. Orucuta fought once in 2018, twice in 2017, and twice in 2016. On paper it appears Orucuta is the harder puncher. Estrada only has twenty five stoppage victories while Orucuta has thirty. However, Estrada has clearly faced the better opposition. He has defeated the likes of Carlos Cuadras, Anuar Salas, Hernan Marquez, Rommel Asenjo, Giovani Segura, Milan Melindo, Brian Viloria. His losses were to Srisaket Sor Rungvisai, Roman Gonzalez, and Juan Carlos Sanchez Jr.
Orucuta hasn’t really defeated anybody of note. His best wins so far were against Edgar Jimenez, Juan Jimenez, and Javier Gallo. His losses were to Omar Andres Narvaez, twice in title fights, Jose Cayetano, and Daniel Rosas. Like to co-main event of the night, the size difference could be a factor. But Estrada is an elite level talent while Orucuta is not.